"Our worst nightmare has come true. 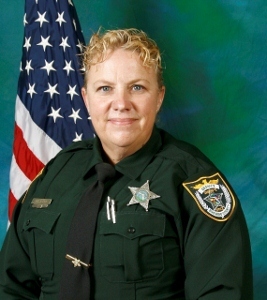 One of our own, an incredible deputy sheriff by the name of Barbara Pill was shot and killed in the line of duty this morning. She was responding to a call where two individuals were seen stealing things from the Econo-Lodge on 192. She pulled over the suspect vehicle. She approached the suspect vehicle. When they wouldn't respond to her commands, she called for back up. Back up was coming to her. When she was waiting for back up, he opened fire on her striking her multiple times, killing her.... At which time they fled the scene. There were witnesses to the crime. The suspects tried to abandon their vehicle in a neighborhood, when a person in the neighborhood saw and engaged them, they got back into their vehicle. Melbourne PD was able to successfully deploy stop sticks. The individual took the corner at too high rate of a speed. The stop stick disabled the front tires and he went into the drainage ditch. Law enforcement did their best to extract the individuals without further injury. Both individuals are in custody at this time. Barbara is very highly decorated, and has been with us for 15 years. She's been a agent, a field training officer, she is the kind of person we could depend on to do anything. She is also from a family of law enforcement. She was one never to stray away from danger. The individuals who we believe killed Barbara is Brandon Lee Bradley. He has a very long criminal history with two felony convictions in 2007. There were four pending active warrants for him. The person who was with him, 19-year-old Andrea Michelle Kershner. She has a criminal history of larceny petty theft, marijuana possession, and battery. Certainly not as violent as his. 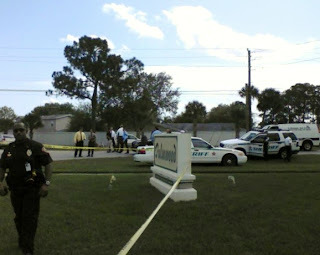 Deputies who responded to her [Barbara], took care of her. We had other deputies pursue the individuals. You have a situation beginning with stealing minor items from a motel, and it ends in the first degree murder of a deputy sheriff. In this case, your dealing with a guy who has active warrants and he knows it. He doesn't want to go back to prison. I'd like to thank the law enforcement support, Melbourne PD is the reason we were able to catch this guy and bring him to justice. This family is an amazing family. Just to give them time to grieve, we are not releasing their indivudaly names. Barbara has been married over 30 years. She raised two boys who became excellent officers. one of them married one of our crime scene techs. We are going to miss Barbara very much." 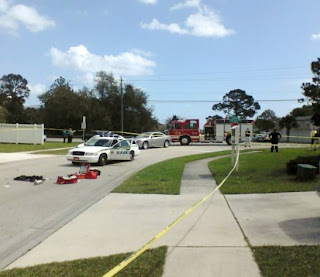 Nearby Melbourne resident Tony Webster said, "I heard several gunshots at approximately 11:10 am and this sounded like about 8 rounds from a semi-automatic weapon. Subsequently, there was about 10 minutes of steady sirens from police and other emergency vehicles." Webster added that neighborhood residents are permitted to leave there homes on foot, but not in a vehicle. Media are not being permitted in the neighborhood near the scene. County Manager Howard Tipton, County Commissioners Chuck Nelson and Andy Anderson, and Interim Brevard EOC Director Kimberly Prosser attended the press conference. Brevard Sheriff Releases 911 Tape: "Oh my God Someone's Been Shot in Front of my House!" On Scene Photo Credit: Tony Webster- Click any photo to enlarge.